We are glad to welcome you on our webpage! Yugmetallsbit Co., Ltd. is the biggest company in southern Russia, specializes in wholesale of high-quality fastener products, produced at Chinese and Taiwan factories. Since 2007, Yugmetallsbit is the importer of fastenings from Southeastern Asia countries. We are always open for the cooperation with suppliers from different countries, such as: Taiwan, China, India, Indonesia, Malaysia and many others. 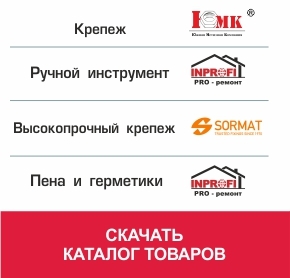 The company is an owner of the trade mark «ЮМК» (this abbreviation is decoded as «Southern Fastenings Company»), that is widely known outside of southern region of Russia. We keen to supply different types of screws and fastenings with certified quality and competitive price. Yugmetallsbit won the good reputation and built up long term cooperation with many factories in China and Taiwan. Our company is aimed to development and goes ahead step by step expanding the range of products. For example, at a particular «Yugmetallsbit» is working together with Turkish manufacturer of polyurethane foam, sealant, mastic, glue and liquid nails. We most heartily invite you our reliable customers to get into our business, to make mutual benefit.